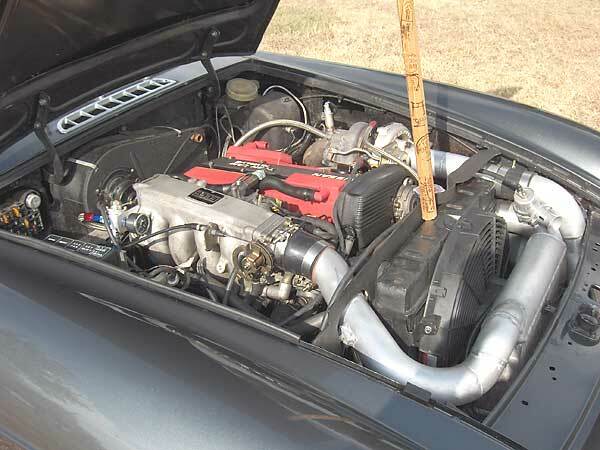 Stock specs: 175 hp and 169 ft-lb., DOHC aluminum head with 16 valves, Garrett T25 (0.48 A/R) turbocharger (mated with an intercooler to increase volumetric efficiency). Fuel is delivered via multi-port fuel injection. Bore is 83.5mm and stroke is 83mm. This nearly "square" design, coupled with the head design, allows the stock CA18DET to spin well beyond 7,000 RPM. 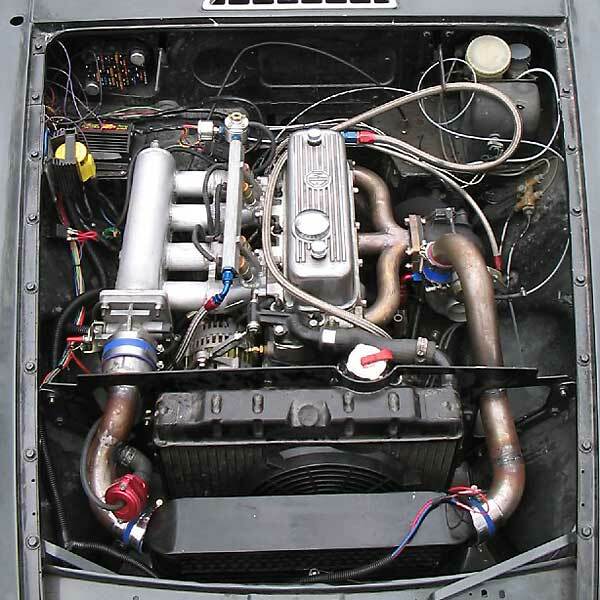 The CA18DET is a robust engine, and many people have produced up to 600hp with modification. 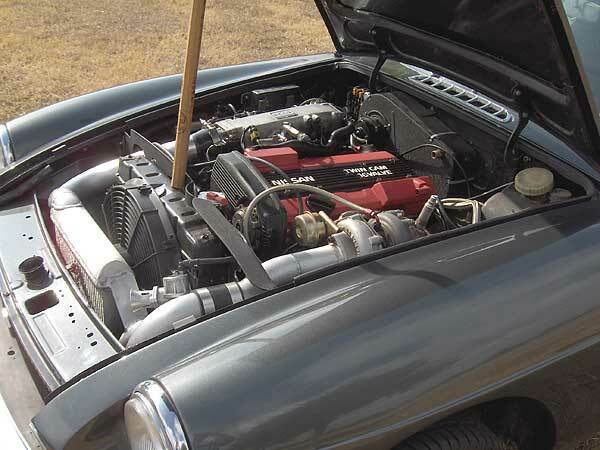 This engine was removed from a Japanese domestic market car, and then imported to the United States. Installed specs: I refreshed the engine with new pumps, TOGA main and rod bearings, OEM piston rings, NISMO head gasket, and OEM engine gasket set and a New Garrett GT28R turbo able to support 450 hp. I fitted a 5 speed gearbox, NISMO forged lightweight flywheel, and OGUR racing clutch. 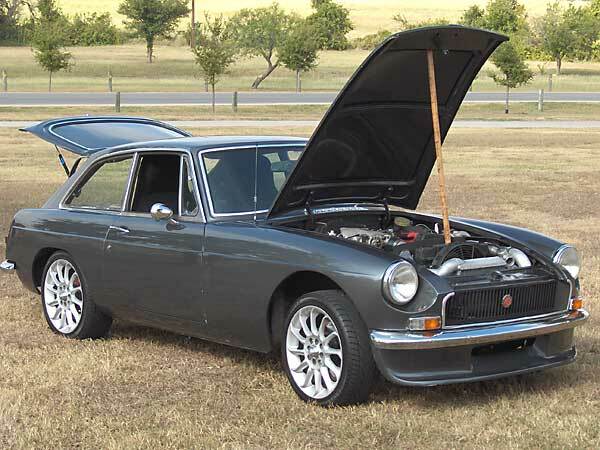 The great thing about most of these parts is that they're readily available here in the U.S. due to the huge "tuner" scene, and also due to the fact that the engine had a U.S.-market sister model (i.e. the CA18DE in the Nissan Pulsar, which was naturally aspirated). Installation details: In order to fit this engine in the car I had to fabricate a few parts. (I purchased a TIG welder, and used it extensively, as follows.) 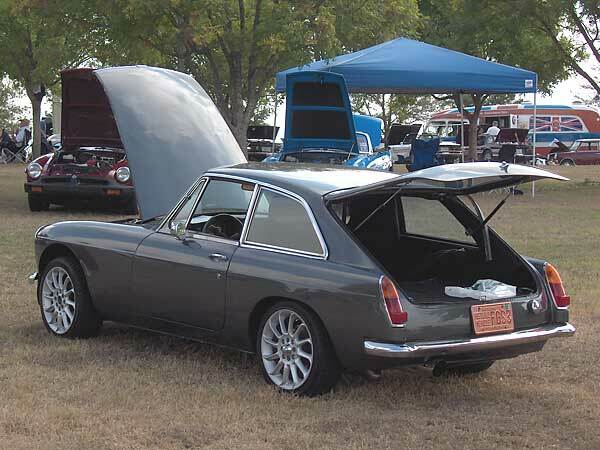 Custom engine mounts were made from a combination of MGB rubber mounts, steel plate and flat bar. 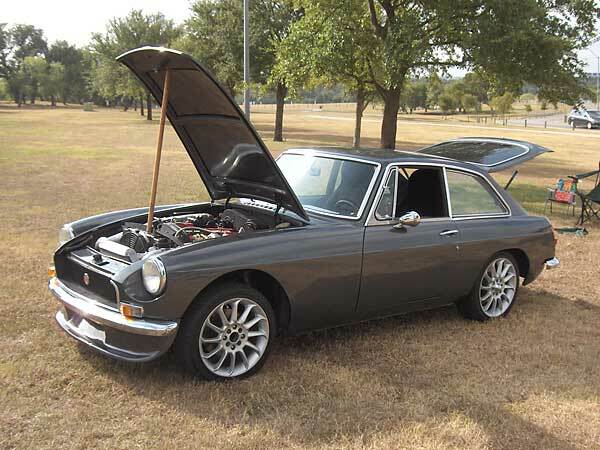 The stock MGB transmission crossmember was modified to accept the Nissan mount. The exhaust manifold was fabricated from mandrel-bent stainless tubing and laser-cut plates. 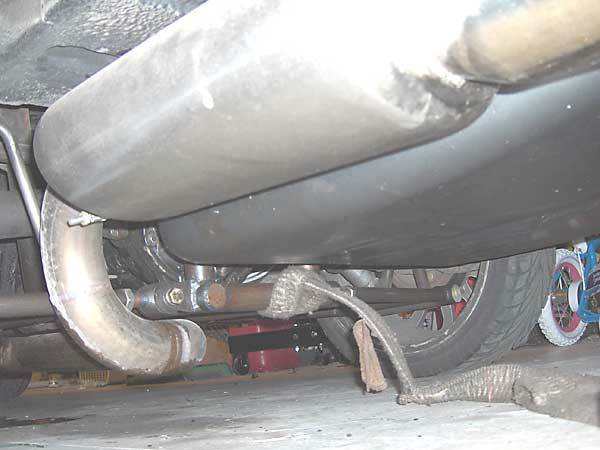 I fabricated the down pipe and exhaust from 2.5" mandrel-bent stainless tubing. 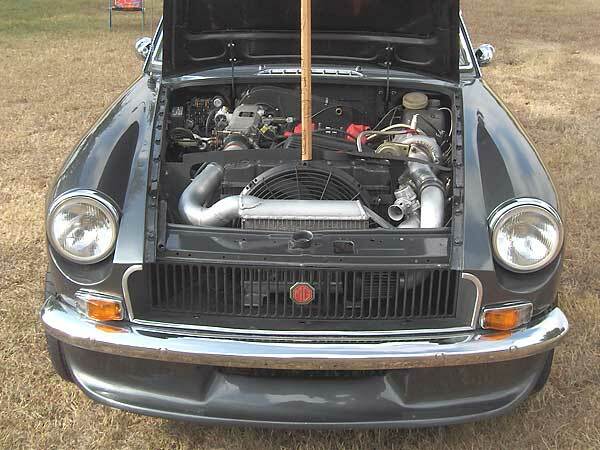 I fabricated the hot pipe, cold pipe and intercooler from mandrel-bent aluminum tubing. The intercooler core is from a Mazda 626, modified with new end tanks, inlet and outlet. The oil pan had to be custom fabricated from a combination of two oil pans and sheet metal. This engine has a front sump so the sump and baffles had to be reworked to accommodate the front suspension cross-member. I estimate that I spent approximately 150 hours in fabrication and design work on the engine installation alone. Engine management: Stock Nissan computer, but with a reprogrammed ROM. Nissan's "ECCS" was a very powerful system that was well ahead of its time; it's able to self-diagnose and manage a multitude of tasks. This system rivals those of the modern systems in the cars on the showroom floor today. Due to space limitations the EMS was converted to a speed-density system. This removes the often restrictive airflow meter and replaces it with a manifold pressure sensor and charge air temperature probe. The Vein Pulse Converter ("VPC") uses a MAP sensor and converts its signal so that the ECU can understand its output. It also adds a high level of tune-ability to the fuel system. Boost control is currently handled by a manual boost controller. The electrical system from the engine was paired to an aftermarket 18 circuit wiring system form Cintech. The entire stock electrical system was removed and updated. 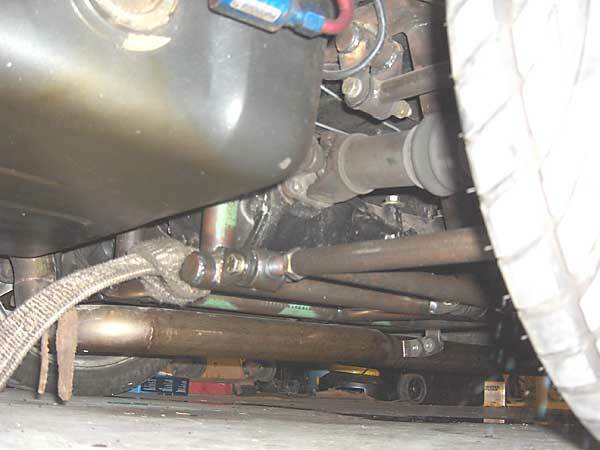 Rear suspension: I custom engineered and built my own IRS with Nissan components. The differential ("R200 model"), hubs, axles, rotors, and calipers are from a Nissan 280ZX. A fabricated sub-frame bolts into the MGB's original forward leaf-spring mounts and into the shock mounts. The suspension utilizes coilover shocks and progressive-rate springs. It has a lower A-arm and an upper dog bone. 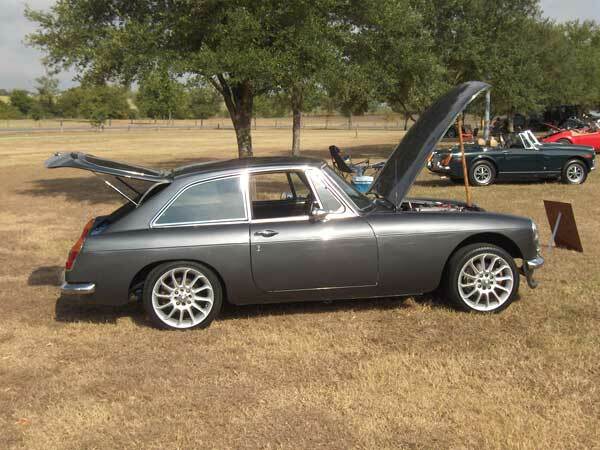 In design configuration, one way to describe it is that it resembles a hybrid between the Hoyle (aftermarket MGB) and Thunderbird Turbo coupe suspensions. I spent many hours engineering this rear: analyzing different control arm lengths and mounting points, control arm designs, roll center behavior, un-sprung weight, etc. In terms of weight, the new suspension is about the same as the stock axle and leaf springs, but through testing, modification, and retesting, I've been able to demonstrate very dramatic handling improvement and that the suspension is exceptionally robust! The system is ready for production, I've received my first order, and my first customer will receive his suspension in October! Interior modifications: Carbon fiber door capping, leather door panels, kick panels, leather headliner, and leather covered dash and new carpet (all from the MGOC club garage). 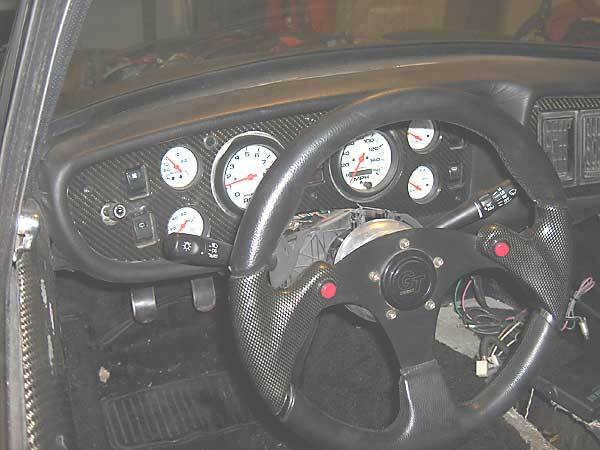 The gauges have been upgraded by using a late 80 MGG LE dash and Auto Meter gauges. I have also added a set of Mitsubishi "Eclipse" seats and 4 point racing harnesses. Todd explained: "The original engine was built with J.E. forged pistons, forged rods, wedge crank, crossflow head, piper 270 cam, roller rockers, custom intake manifold, custom exhaust manifold, T2 turbo, Accel DFI, T5 transmission using a Rivergate conversion. The engine underwent a few improvements thru the years as my fabrication skills and tools got better. I upgraded the turbo after failure of the T2. Well the T2 has been out of production for some time so I installed a GT28R which now I see was the undoing of the B engine... 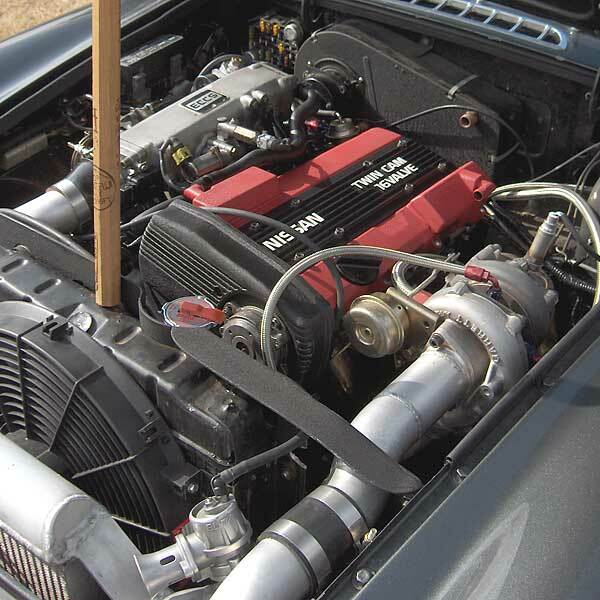 The GT28 produces well over 30lbs of boost and will support over 330hp. At the same time I upgraded the Turbo, I also upgraded the ECU to an Accel DFI Gen 7. Well 16lbs of boost on a B series engine must be too much because BOOM she went!"